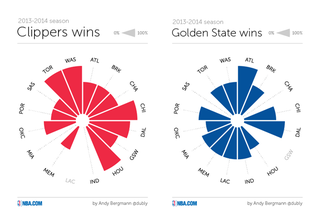 Over on NBA.com, Andy Bergmann (@dubly) has put together some neat radial charts showing the head-to-head records between this season's playoff teams. Not every piece of info is useful—it probably won't be relevant that the Rockets went 2-0 against the Bobcats—but they're a nice representation of how these squads stacked up against the the league's best. While the Clippers went undefeated against the Rockets, Bulls, Raptors, and Wizards, Golden State mostly managed series splits, holding an advantage over just the Mavericks (the West's 8-seed) and the Hawks (the East's 8-seed). You can see the full set of charts over on the Hangtime blog, where Andy previously posted his ball-movement graphics. Below are the radials for Houston-Portland, Chicago-Washington, and Toronto-Brooklyn, the three other intriguing first-round matchups.